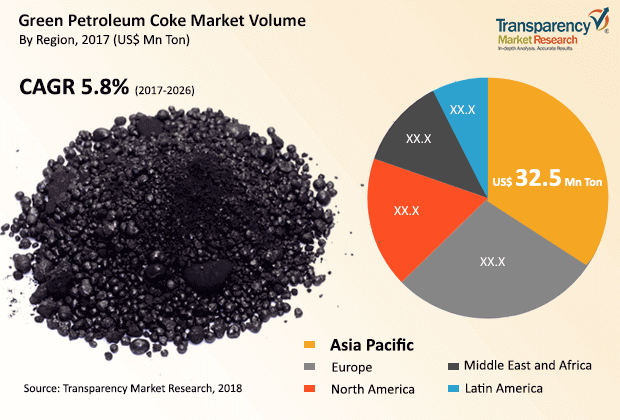 The global green petroleum coke market is anticipated to see a healthy growth in the coming years, according to a Transparency Market Research (TMR) report. The market’s competitive ecosystem is expected to witness an influx of new players, who are hoping to gain from the bountiful opportunities in the market. Established vendors in the market are seen focusing on expanding their production facilities. For instance, one of the leading vendors in the global green petroleum coke market, Alba, started a huge expansion project. The company is slated to become the largest single-site aluminum smelter of the world by increasing their production capacity to 1.5 million metric tons per year. Vendors in the global green petroleum coke market are also allocating resources towards the promotion of green petroleum over conventional sources. Mergers and acquisitions and launch of new products are other key strategies adopted by players in order to gain traction in the market. Prominent vendors in the global green petroleum coke market are Asbury Carbons, Minmat Ferro Alloys Private Limited, Sinoway Carbon Co., Ltd., Oxbow Corporation, and luminium Bahrain (Alba). TMR analysts predict that the global green petroleum coke market, which was estimated to be at US$ 12 bn in 2016, will reach a value of US$ 21 Bn by 2026. Over the forecast period of 2017 to 2026, the market is expected to rise at a 6% CAGR. Among the different forms the product, the segment of sponge coke is expected to remain dominant over the forecast period. In terms of geography, North America and Europe are expected to leading regional markets in the global green petroleum coke market. The market for green petroleum coke is powered by the electricity sector, power plants, building, and increasing demand in the aluminum and steel sectors. Increased production of aluminum and increased use of petroleum coke in the Asia-Pacific power and cement industries are factors that significantly drive growth in the oil coke market. Another key factor that drives the market is that green petroleum coke emits less carbon, if its sulfur content is low. As a green petroleum coke has not been identified as a hazardous material by the Environmental Protection Agency, it is now growing. The growth in rail, car and transport development is leading to increased demand for steel, and petroleum coke has also demanded the expansion of the green petroleum coke market. There is relatively little ash content of green petroleum coke and therefore minimal toxicity in a wide range of industries. The growth of the Green petroleum coke market is complemented by lower freight costs combined with better conservation of resources. The implementation of stringent rules on a number of industries requiring carbon reduction as well as increased use of environmentally responsible fuels and increased costs and the depletion of coal resources all have a key role to play in boosting the market. The growth of the market for petroleum coke is forecast to benefit lucratively by countless industries that require a reduction in carbon emissions and increasing the use of environmentally-friendly fuels combined with increased costs and reduced coal resources. The expansion of the petroleum coke market is, however, forecast to be obstructed in the future by oscillating costs and lack of product supply. However, widespread financing of production units and the increasing number of companies that operate worldwide can reduce the hindrance to the market.